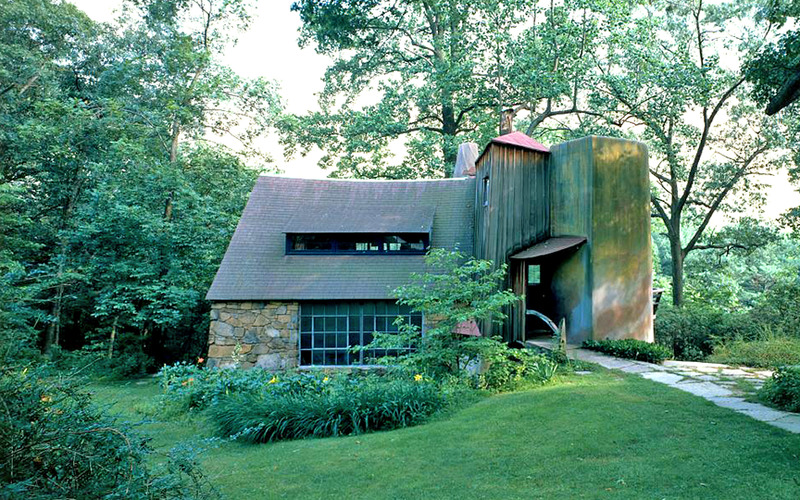 Photo: Wharton Esherick House & Studio, ca. 1926, 1520 Horseshoe Trail, Malvern, Chester County, PA. Listed on the National Register of Historic Places in 1973. Photographed by Jack E. Boucher, n.d., Historic American Buildings Survey [HABS PA-6034], memory.loc.gov, accessed December, 2013. Chester County Courthouse is located at 2 North High Street, West Chester PA 19380; phone: 610-344-6100. One of the three original counties formed by William Penn in November 1682. It did not become an inland county until 1789. Its name derives from Cheshire (i.e., Chester-shire), England, from which many of its early settlers came. West Chester, the county seat since 1788, was incorporated as a borough on March 28, 1799. It was named for Chester, the older county seat (now in Delaware County), which in turn derived its name from the shire town of Cheshire. Quakers were very influential in the early period, and an older Swedish population that pre-dated William Penn's charter was absorbed. Chester shares with Montgomery County the Valley Forge encampment and with Delaware County the Brandywine Battlefield. Iron works began before the Revolution, followed by production of paper, textiles, and bricks. Accessibility increased with the Lancaster Pike (1795), Schuylkill Navigation Canal (1825), and Columbia Railroad (1840s). In the 1890s the county became a residential location for commuting Philadelphia workers. Chester was an early producer of a valuable mushroom crop, and has long excelled in fruit growing, dairying, livestock breeding, and raising flowers. Thirty percent of the land is farmed. The Pierre du Pont Arboretum and Gardens arose in the nineteenth century. The institute that became Lincoln University was founded in 1854 to educate African Americans, and there were Underground Railroad stations at West Chester, Phoenixville, Oxford, and Kennett Square. Chester County comprises 760 square miles and is located west of the city of Philadelphia in the Delaware Valley Region of southeastern Pennsylvania. Chester County was organized by William Penn as one of three original counties in Pennsylvania. Chester County is classified as a Third Class Pennsylvania County as its 2000 population of 433,501 falls between the 225,000 to 500,000 range reserved for Third Class Counties. Chester County Government is headquartered in West Chester, Pennsylvania and is administered by a three-person Board of Commissioners that is elected to four-year terms. The Commissioners have selective policy-making authority to provide certain local services and facilities on a countywide basis. Accordingly, the Commissioners are responsible for the management of the fiscal and administrative functions of the County. Other elected officials in County Government include the District Attorney, Clerk of Courts, Controller, Prothonotary, Recorder of Deeds, Register of Wills, Sheriff, and Treasurer. Currently, statutory elected County offices include a Coroner and two Jury Commissioners. The judicial branch of Chester County Government consists of the Court of Common Pleas and nineteen Magisterial District Courts. Chester County is comprised of 73 municipalities, including 57 townships, 15 boroughs, and one city. Each of the 73 municipalities is governed by an elected board - supervisors, councils, or commissioners, depending on the municipal designation. Each is responsible for establishing and administering municipal financial budgets and tax rates, and providing general services and road maintenance. In addition, municipalities are responsible for land use controls through zoning and subdivision regulations and building permits. Chester County is part of the Piedmont Province of the Appalachian Highlands. Elevations within the County range from 1,020 feet at Welsh Mountain in northwestern Chester County to 66 feet above sea level where the Schuylkill River flows out of the County at Valley Forge National Park. Major streams in Chester County include the Schuylkill River, Brandywine Creek, French Creek, the Red and White Clay Creeks, Octoraro Creek, and the Big and Little Elk Creeks. Approximately 82% of the land area in the County drains to the Delaware River and Delaware Bay. The remaining land area drains to the Susquehanna River and Chesapeake Bay.